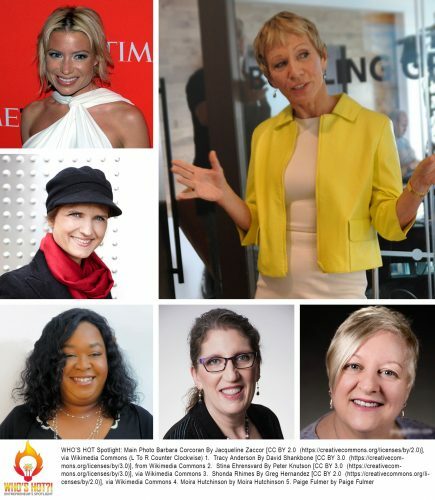 Who’s Hot Spotlight™, presented by America’s Favorite Motivators™ announced this week’s featured entrepreneurs were: Barbara Corcoran, Tracy Anderson, Stina Ehrenvard, Shonda Rhimes, Sarah Lacey, Sallie Krawcheck, Steph Korey, Stephanie Lampkin, and Tina Sharkey. Barbara’s credentials include straight D’s in high school and college and twenty jobs by the time she turned twenty-three. It was her next job that would make her one of the most successful entrepreneurs in the country when she took a $1000 loan to start The Corcoran Group. Tracy has helped countless celebrities transform their bodies, including Gwyneth Paltrow, Jennifer Lopez, Alessandra Ambrosio, Victoria Beckham, Nicole Richie, Robert Downey Jr, Olivia Palermo, Hilary Rhoda, Olivia Wilde, and even Miss Piggy. The beauty of the Tracy Anderson Method is that people everywhere can get access to the same training in their own living rooms. Stina is the founder of Yubico. Their mission is to make secure login easy and available for everyone. In close collaboration with the leading internet companies and thought leaders, they have created native support for security keys in major online platforms and browsers, enabling a safer internet for billions of people. Steph is the Founder of Away, a global lifestyle brand creating thoughtful products designed to make travel more seamless. Stephanie is the founder and CEO of Blendoor, which uses people analytics software for inclusive recruiting. Tina Sharkey is the co-founder and CEO of Brandless, a fresh approach to consumer commerce. Who’s Hot Spotlight™ is a weekly video news show. It features international stories and insights from inspiring and motivating celebrities and entrepreneurs. Presented by America’s Favorite Motivators™ and executive produced by America’s Favorite Business Coach™, Maurice W. Evans, the show is distributed on Amazon’s Video Platform, Youtube and the show’s website. Various selected and promotional guests are interviewed by Evans and various special correspondent hosts. For episodes visit: (https://www.WhosHotSpotlight.com). America’s Favorite Motivators™ are the World’s Greatest Speakers, Coaches and Trainers. Represented by a diverse group of authentic, heart-centered and mission-driven experts, they help entrepreneurs and professionals achieve their highest potential. Their top-notch training program is proven to help turn students into highly-paid speakers, coaches and trainers. Visit: (https://www.FavoriteMotivator.com).